DESOTO—The DeSoto girls track team racked up 69 points to win the Class 6A girls team state championship for a third-straight season on Saturday at Mike A. Myers Stadium. With the win, DeSoto moved into sole possession of third most team titles with its seventh. The Eagles are now two behind Dallas Skyline (9) and four behind Lancaster’s 11 team titles. Since 2011, DeSoto has won six of the last eight titles, with two stretches of three-peats as champions mixed in. 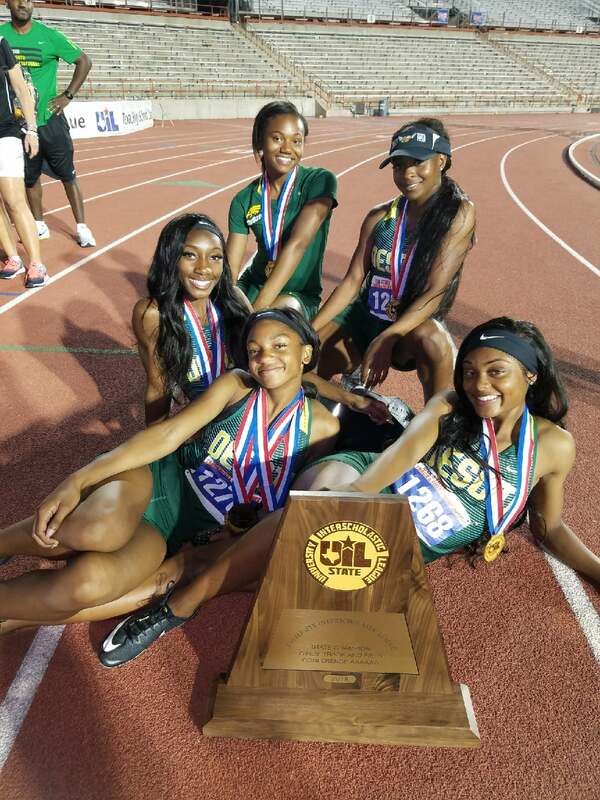 DeSoto captured points in the discus, shot put, 100 and 300-meter hurdles, along with the 4X100, 4X200 and 4X400-meter relays with nine athletes. The majority of their points came from first-place finishes in the 4X100 and 4X400-meter relays. DeSoto senior Jada Laye, who ran the anchor on the 4X100-meter relay, finishes her high school career with three-straight team titles. “It’s an amazing feeling,” Laye – a University of Iowa signee said. 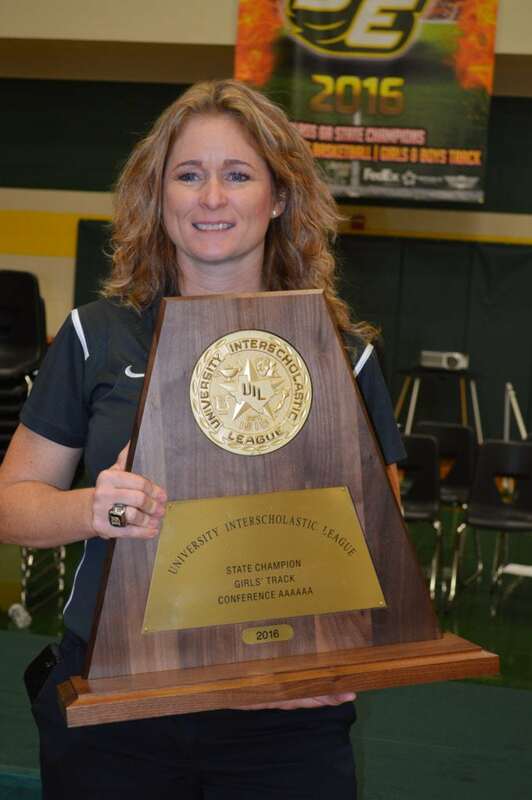 Earlier this year, DeSoto ISD alumnae, Assistant Athletic Director and Head Track and Field Coach June Villers was named Coach of the Year and was inducted into the Texas Track and Field Coaches Association Hall of Fame on January 5. At the TFA event, Villers was introduced by her mentor, Villers’ former DeSoto ISD Track and Field coach, Brent Jones, and recognized alongside Olympians Michelle Carter and Trey Hardee. Villers was presented her award by fellow Hall of Famer and Track and Field coaching legend Beverly Humphries. Villers, a 1991 graduate of DHS, brought five State Girls Track titles to DeSoto ISD – four as the head coach and one as Brent Jones’ assistant in 2007. During her tenure, the girls track team finished as the State Team runner-up three times and third place two additional seasons. Villars was named Track & Field Coach of the Year eight times by four different organizations, including three by the Texas Track and Field Coaches Association. Villers has been twice named National Coach of the Year. Villers has developed nationally-ranked athletes in all three relays, long jump, triple jump, high jump, discus, shot put, hurdles and sprints. She has also mentored her student-athletes with the goal of successfully transitioning them into collegiate athletes with over 30 of her protégés signing full scholarships and a host more who have gone on to sign partial or academic scholarships. Previous article2018 Chevrolet Silverado High Country – Driving in High Cotton!